Phuket Town serves up the kind of food that cravings are made of. Here you will find one of a kind dishes that you can’t get anywhere else. It’s simple, delicious, southern Thai cuisine without all the bells and whistles. You’ll find bold, complex flavors that add more than just “spice’ to a dish and a welcomed attention to detail such as fresh seafood, homemade fish paste, and Thai herbs flown in from Phuket to maintain the authenticity of the dishes. 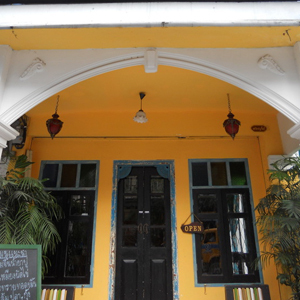 The venue is a family run eatery that is small and cozy and decorated in an eclectic “Shino-Portuguese” style that is common to old Phuket. It’s literally a colorful mix of Chinese, Thai, and European aesthetics that are reflected in the food and the décor. Take a taxi from the Thonglor BTS Station. Phuket Town is located at the corner of Thonglor Soi 6 off Sukhumvit Soi 55. Look for Market Place Tonglor, and it should be in a shop house nearby.